I first saw the work of Toshio Iezumi on Chappell Gallery's web page on the web site of the SOFA Expo, held in Chicago in the fall of 2000. As soon as I saw his work, I immediately visited Chappell Gallery's web site. What I saw there really amazed me, so I e-mailed Alice Chappell, the gallery owner, and after a series of messages, decided to acquire this work. The method that Toshio-san uses to create these works is not unlike carving stone, except that he doesn't use a chisel. 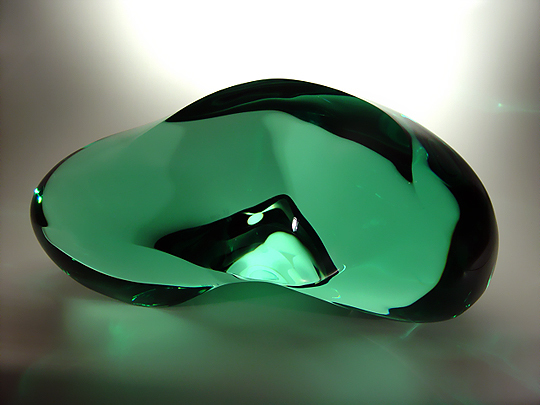 First, he laminates a set of glass plates into a large mass; this is his "stone". Next, he uses a diamond-bladed saw to cut the mass into a rough form. Then, he uses a series of six increasingly-fine hand grinders to refine the outer surface of the form. Finally, he uses a felt buffer to polish the surface to perfection. Of all of the works in my collection, this work is the most abstract; it is basically just a shape. However, because of Toshio-san's considerable skill in working the glass, the surface creates wonderful effects using whatever light intersects it. The simplicity and elegance of this work really appeal to me... I'm glad to have this work in my collection. The name of this work, F.020999, tells you what type of work it is ("F" stands for "form") and when it was completed (February 9, 1999).